TORONTO, ON – Northern Maverick Brewing has announced the opening of its spacious restaurant and brewery in downtown Toronto. 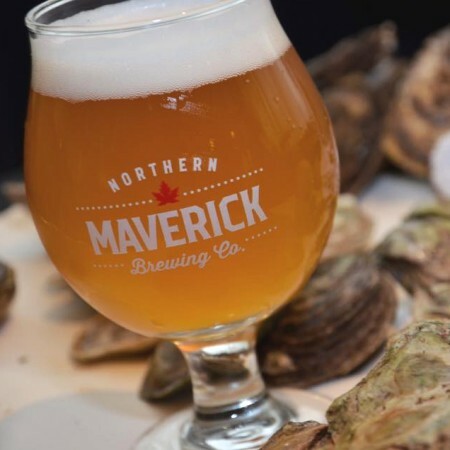 Located in an 11,000-square-foot space at 115 Bathurst Street north of King West, Northern Maverick has been founded by Jason Kaptyn, and features a 400-seat restaurant and patio with a farm-to-table themed menu by chef Mark Cutrara; a 10 hectolitre brewhouse tended by head brewer Andrew Crowder (ex-Muskoka Brewery); a bar and cocktail program developed by bartender Japhet Bower; and a retail store. Beers currently available include Handcrafted Lager (“Vienna-inspired lager featuring aromas of toasted cereal grains with notes of bread and light caramel”), American Pale Ale (“orange and grapefruit balanced with a subtle hint of caramel sweetness”), White IPA (“flavours of grapefruit, orange zest, tropical fruit and coriander”), First Day IPA (“subjected to a barrage of Centennial, Cascade and Citra, giving the beer an unmistakable citrus flavour and aroma”), and Gose (“slight tartness, subtle noble hops and an essence of coriander”). The Lager is also available in 473 ml cans at select LCBO locations. The Northern Maverick restaurant is open from 11:00 AM to 1:00 AM on Monday and Tuesday, 11:00 AM to 2:00 AM on Wednesday to Friday, 10:00 AM to 2:00 AM on Saturday, and 10:00 AM to 1:00 AM on Sunday. The retail store is open from 11:00 AM to 11:00 PM daily. For more details, see the Northern Maverick website and Facebook page.